Meathead Movers is here to take care of the heavy lifting for you on your move to Reseda. Our clean-cut student athlete movers are ready to get you safely settled into your new Reseda home. With a population of around 60,000 people, Reseda seems to be a popular place to call home. It’s located in the San Fernando Valley and was one of the first suburbs to spring up in that part of Los Angeles. Reseda’s big boom happened right after World War II, when its population exploded. Since then, things have settled down, making Reseda a perfect suburban environment. One fun thing about living in Reseda is that it’s been featured prominently in many famous movies. In “The Karate Kid,” Daniel moves to Reseda from New Jersey. Some of the most exciting scenes in “Terminator 2: Judgment Day” also took place in Reseda. So keep your eyes peeled while living here, you might just see a few movies being filmed. Although the neighborhood has been featured in numerous films and television shows, Reseda is a relaxed and serene community that is a great place for families and retirees. If you are moving to Reseda, you are going to need reliable Reseda movers. You should look no further than Meathead Movers. Whether you are coming to Reseda from across the country or across the valley, you shouldn’t trust your belongings with just anyone. 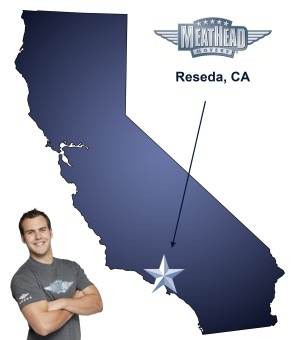 Meathead Movers is vastly experienced in helping people move to Reseda. Our moving company specializes in local, long-distance, and commercial moves to, from, and within Reseda. Our Princess Packers are available to pack up all of your belongings for you, and our clean-cut student-athlete movers receive exceptional amounts of training to ensure a smooth moving experiences. If you need help finding a babysitter, a handyman, or other services, Meathead Movers’ concierge services will be happy to help. Our goal is to make your move to this part of Los Angeles as easy and trouble-free as possible. For a free moving quote, pick up the phone and call Meathead Movers, the premier Reseda movers, today. With our 100% satisfaction guarantee, the only thing you have to lose is the stress that comes from moving! Moving to Reseda? Here are some helpful resources. Great service, great attitudes, great job! Timeliness, communication. My belongings were loaded and unloaded with care. your college guys were professional and also made the experience enjoyable,despite the stress of the situation. There were no hidden extra charges that some movers are infamous for. The estimate was right on.